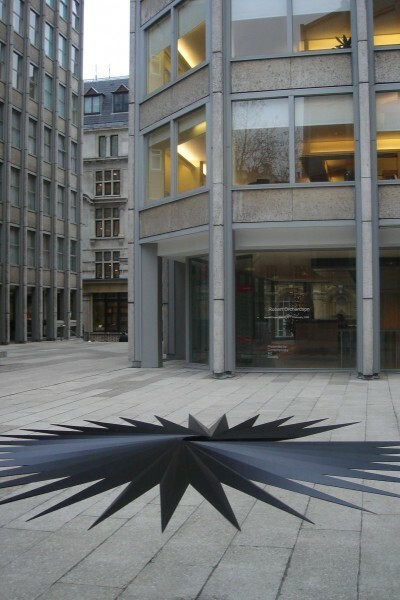 Robert Orchardson has created a site-specific sculpture for the Economist Plaza that plays off the modernist utopian aesthetic of the trio of 1960s Smithson-designed buildings surrounding it. 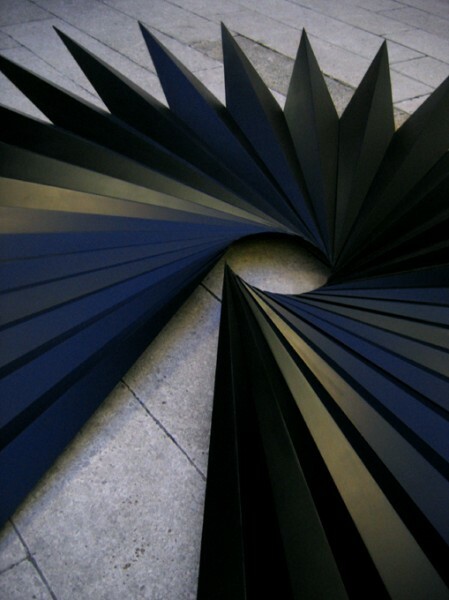 A series of elongated diamond-like forms balance against one another, spiralling round a circular void at the apex of the structure. Typical of Robert Orchardson’s works, the design is a hybrid, inspired by a variety of sources referencing futuristic sci-fi films and utopian modernist architectural features with nuances of spiritual optimism. The sculpture alludes, among other things, to Oscar Niemeyer’s landmark Metropolitan Cathedral of Brasilia (Brazil) completed in 1960, but Orchardson also notes that the work draws from elements of the crystalline portal called the ‘Carousel’ through which citizens were spun in a ritual dance of death, floating and exploding as a way of achieving renewal and re-incarnation, in the futuristic 1976 film Logan’s Run, set in the 23rd century. Orchardson also likens it to a camera’s aperture. One can almost imagine the form twisting, contracting and expanding to provide a better visual focus of the views and skyscrapers towering above it. Concepts relating to states of change and metamorphosis are important to Orchardson’s work. Frequently the works themselves focus on some sort of transitory state somewhere between the work’s own physical materiality and some inherent sense of transcendent aspiration. The title for the Economist sculpture, The substance of things unseen paraphrases a quotation from the Bible, which considers the idea of faith. How we might relate to both our immediate situation and reality, as well as beyond, to something unknown. 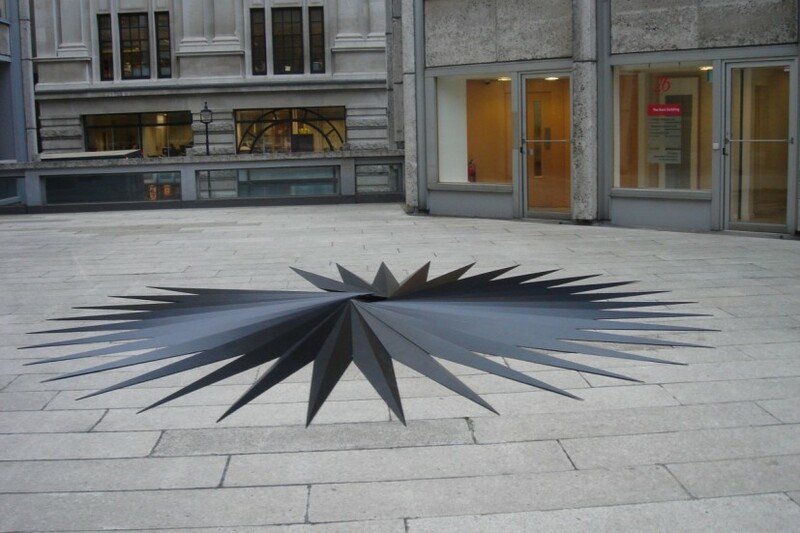 The artist sees his work as similarly engaging with a transitory middle ground in the centre of the Plaza, offering passers-by multiple viewpoints beneath, through, and around its geometric silhouette as they encounter it and walk on. It offers its viewers a fleeting chance to re-negotiate and connect with the space and world around them. Born in Glasgow and based in London, Robert Orchardson graduated from Goldsmiths College in 2004. He is currently showing in Bloomberg New Contemporaries, 2005, Arte all’Arte in Tuscany and Liquid Crystal at Lothringer Dreizehn in Munich. Solo exhibitions include Perfect Vacuum, Wilkinson Gallery, London, 2005; Beyond, Monitor Gallery, Rome, 2005; Symmetriad, Galerie Ben Kauffman, Munich, 2004; and News from Nowhere, the Changing Room Gallery, Stirling, 2002. Orchardson is represented by Wilkinson Gallery, London.